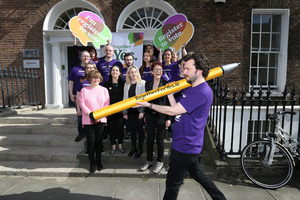 The together for Yes campaign launching a voter registration drive ahead of the deadline on May 8 in the forthcoming referendum to remove the Eight Amendment from the Consitiution. 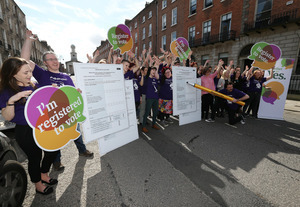 According to Together4Yes, there are 122,000 young people who have turned 18 since the last General Election with 466,000 people between the ages of 18-25 currently eligible to vote in Ireland “if they are registered”. #Repealthe8th is NOT about #Kerrybabies, Magdalene Laundries, Anne Lovett or the Catholic Church. Posted in Misc and tagged The Eighth Amendment at 12:16 pm on April 19, 2018 by Bodger. That is a terrible slur on monkeys! The lesser known REM b-side…. Every one of them carries out abortions? Crikey. david, what I’m about to say has nothing to do with the referendum debate, but seriously, go feck yourself. Thats no more a 12 week scan! If that is 12 weeks then it must have been born fully grown while doing a tap dance. Ever try being born smoking a cigarette? Time to shut up now david, there’s a good chap. And “Emma Murphy” is no more an Emma Murphy than I am! She’s a piece of work, whoever s/he is. The kind of person I’d relish giving a good verbal battering. That would absolutely be a twelve week scan. My daughter was kicking and clearly moving both arms and legs in her three month scan. It was the most incredible thing to see. No it absolutely is not. That is closer to a 20 week scan than anything. A scan at 12-14 weeks looks entirely different. The foetus is nowhere near as well-formed at that stage. Well I have to disagree. Having seen a scan a twelve weeks only a few short months ago, the legs of the baby were literally kicking off the side of the womb almost like a child on a swing. But sure you were there. And you know all I’m sure. Having actually carried a child, having actually experienced a pregnancy for myself I think I would know better actually yeah. And I can assure you that 12 week foetus does not move in that manner or even look like that. But carry on being smug yourself and peddling lies. Having just had a son 5 weeks ago I vividly remember his 12 week scan and this video is nothing like that!!! The 12 week scan for my kids looked much like this. To be fair, I don’t see on the tweet that she’s claiming it is a 12 week scan though. For some reason pro life people are more inclined to emphasise the obviously childish traits of a foetus- arms, legs, fingers, toes etc. Whereas some pro-choice people would have you believe that a human foetus before 12 weeks looks like a smudge of ketchup. I think people can see through that. Other than the bit where the tweet says “12 wk scan video”? Ah yes. I see it now Repro. yeah, yeah. you sure it’s definitely yours? A no voter who doesn’t trust women. I had a look on yer wan’s twitter, oh holy jaysus I had to stop. And no, that is not a 12 week scan. Yet another Pro Life twitter account that tweets about nothing but Pro Life. I changed my twitter pic to a Pro Choice slogan and tweet about Repeal but I also tweet about a heap of other things. Maybe I just lack their single minded fanaticism. Why is it not a twelve week scan? When do you suggest it is doctor? The formation of the head and legs, the movement of the foetus for a start. Such assurance, for someone who doesn’t actually have a clue. Agreed. As for the movement, my baby at his 12 week scan was literally bouncing. I can’t imaging having ‘actually carried a child’ and being this clueless as to what a baby looks like at twelve week scan. Frightening really. But yea, peddling lies…of course. Oh, doctor noel is that you? Agreed. I’m tired already. But then, I woke up tired this morning. 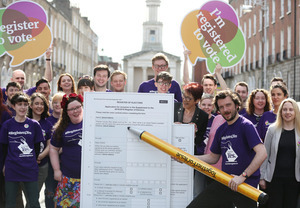 Just 5 weeks to go to the vote, then the count, then the accusations of fixing the ballot (Sentient Won has already suggested that Repeal will do this) and then the prayer rallies outside the Dáil while they debate the legislation. Then it’ll be over for a while. Happened before. Do you really think it wouldn’t happen again? Rigged vote claim based on reported turnout and actual turnout? Even the article that claim links to as evidence for the reported turnout is laced with “about”, “approximately” and “estimated”. Straw clutching at its finest. You don’t think the fact of the second vote was a hack of democracy? On instructions from the EU? With the lies and propaganda? And if all that doesn’t work do you really think they wouldn’t stuff the ballot boxes in order to get what they want? Abortion is big business. Don’t you think it’s worth being aware of how votes and voters are manipulated? So, the claim that the vote was rigged is not based on the link you posted but on the “do you really think they wouldn’t stuff the ballot boxes in order to get what they want?” argument without any evidence at all? There is some evidence: dodgy shenanigans with ballot boxes at the Cork count during Lisbon 2. Ifs could haves and maybes are speculation, not evidence. Oh my god I forgot about the legislating part. Dublin will be impassable for geriatrics reciting holy cant at our godless legislators. Reckon we’ll get it out of the way before the Pedo Ltd. CEO comes to town? Does nobody work in this country anymore? Who’s got the time to go around badgering people with this stuff? Students and crappy comedians? Volunteers who find the time to contribute whenever they can while whingers moan at them from the sidelines. You think the whingers are failed chuggers? Possibly, but I’d hate to speculate. Just saw your “Do you hear yourself?” comment below but couldn. What world do you live in at all? In the realy world, we have a small thing called a national constitution and most people tend to acknowledge it. holy crap…you must run on context-less brainfarts! …but god bless you, you truly are the creepiest of the creepy white knights. We’re having a little referendum to change the constitution. Haven’t you noticed? It really is eye opening the amount of smug Yes voters suggesting the video isn’t a twelve week old baby. It shows the absolute lack of education of voters. I’m voting yes by the way before I’m accused of being some ‘idiot No voter’. Why? Because I’m expressing an opinion different to yours? I reckon it’s because you’re lying. There’s a very good reason we have Mildred crushes. A 12 week old baby doesn’t need a scan as it’s probably in a cot or a moses basket if not being carried around by proud parents/grandparents. I think it’s crazy that all the No voters are basically abusing their kids and beating their wives/husbands and wouldn’t hesitate to gut a living child if they had them alone. Why are you voting no? I’m voting I’m Sorry Can You Repeat The Question? I was taken off the register, sometime since the last election. I had to register again last week. I’m now on the supplemental register. Very odd. The point is that if repeal fails, we’re back to where we are now, with 12 women a day crossing the sea for abortions that are illegal in Ireland, and many more taking pills without medical supervision. Stopping repeal won’t stop abortions. It will stop a lot of abortions. Not all. Definitely stop a lot of women getting proper medical treatment, so yay! That’s because it’s already doing it all the time and nobody notices because it’s women. It kind of will, but carry on. It does. It impacts the birthing process in hospitals as well as treatment of various diseases and health conditions. There are many attestations to this online if you care to read them. He doesn’t. But I think we already knew that. It will stop a few abortions. For people that are either too poor to travel, or who cannot travel for other reasons. If Repeal fails, we will still live in a country that values the life of the unborn. This was mainly kicked off by what happened to Savita Halappanavar and the outcry that it not be repeated. While we have The Protection of Life During Pregnancy Act 2013, some people are quite happy to overlook it….just like the Civil Partnership act in the last referendum. Abortion on demand and the inevitable introduction of privately run abortion clinics is clearly at the heart of this and thankfully we have a right to say if this is the society we want for ourselves. If Repeal fails and Irish law won’t accommodate, it’s back to where we have always been where you can go abroad if you so choose. Honestly, I think people need to Google “12 week scan” and look at the countless images of 12 week foetuses. They look identical to the baby bouncing in that tweet. Furthermore, anyone who has been pregnant or attended a 12 week scan (especially one using up-to-date equipment and screens) will recall that the baby looks and behaves like this – often kicking, moving and bouncing as still has a lot of room to manoeuvre at that stage of the pregnancy. I can only conclude that some pro-choice people will never be willing to acknowledge that a foetus has any human characteristics. What might be useful is if one the pro-choice commenters here would link to any online image of a 12 week foetus that they feel supports their position on how a typical 12 week foetus looks. I will not be party to the coercion of women against their will and the equating of women as on a par with a fertilised egg. Yeah, the humanity and development of the foetus is “irrelevant” to this discussion alright. Lol. It’s a distraction and an irrelevancy to this debate. You want abortion performed in England rather than in Ireland, you are not proposing to outlaw it, you just want it taxed by Ryanair. The question is WHERE Irish abortions take place, not if they will or should. So the humanity and development of the human foetus is irrelevant to the discussion around whether we should remove all legal protection for the human foetus. I don’t want abortion, except to save the life of the mother, carried out in England. Or any other jurisdiction. While abortion is legal anywhere in the world there will always be opportunity for women to access it. This is a sad fact. But it is not reason for Irish people to stand over the stripping of rights from the unborn and abortion on demand. I think people are starting out in different places. For me, there has always been abortion. This can either be done safely (as possible) or as a back-street abortion (or getting ‘pills’ online). 12 Irish women travel to the UK each day to get ‘safe’ abortion. ?? Irish women buy pills online and take them each day.Ireland is failing these women (and their partners). For me – the best thing to do is to make abortion available in Ireland – as safely as possible. – improve support for disability, so if women find out that their child will be disabled that they are making an informed choice on continuing with the pregnancy or not. Do you hear yourself? It is up to the woman if the child is to be born or not. Inasmuch as there as any meaning to being human it is this: a woman will be responsible for whether you will be born or not. It will be her actions and her choice that result in a human being coming into the world. That is the first thing that it means to be human. Your mother will decide whether you are born or not, except where men exercise the power to force her to do so against her will. I get that it grinds people’s gears that women, of all the genders, should have that power over life, but if you want that power, get yourself kitted out with a womb. If you don’t want abortion don’t have one. All you’re voting on is the geographical location of the clinic and the journey’s women have to make in what can be their darkest hours. 100% with you on that Cian. No, we’re voting on whether we – a self-sustaining nation of people on our island home – want to participate in the world-wide abortion industry that destroys 56 million innocent human lives every year. Abortion is not health care: it’s genocide. Please educate yourself as to the meaning of the word genocide. You are making yourself look stupid. Genocide is the deliberate killing of a large group of people. Is 56 million human lives destroyed (on an annual basis) not a large enough group of people for your definition? Human lives. Living breathing people. Not embryos. And we are back to the same old question – when does life begin? The main religions differ but the Catholic Church is the only one which maintains it is at conception. That IMO, is nonsense. The predominance of human biological research confirms that human life begins at conception—fertilization. At fertilization, the human being emerges as a whole, genetically distinct, individuated zygotic living human organism, a member of the species Homo sapiens, needing only the proper environment in order to grow and develop. The difference between the individual in its adult stage and in its zygotic stage is one of form, not nature. SOQ. That a new human life begins at conception is not a religious viewpoint. It is a scientific one. At conception an entirely new human being is created, with its own genetic make-up. It is not its father and it is not its mother. It is a unique human being. There is no defensible scientific, moral or ethical argument to say that human life begins at any other point – 6 weeks, 12 weeks, 24 weeks, 30 weeks, birth…..its all nonsensical to suggest that life begins at any other point but conception. Nicely side stepped lads but not exactly what I was referring to. Do you not agree that the Catholic Church is the most anti abortion of all the main religions? I don’t know enough about other religion’s views on abortion to compare, but I think you might be right that the RCC takes abortion particularly seriously. I’m not sure what religion has to do with abortion though. On your original point though – that it is nonsense to believe that human life begins at conception – you are, as pointed out above, demonstrably wrong. So by that logic, certain types of contraceptive pills are actually abortions? As for religion and especially the CC, I think the connection is fairly obvious. It doesn’t take a genius to figure that there is a connection between a country which was Catholic theocracy and some of the most extreme anti abortion laws in the world. As for the RCC. Live in the past if you like, with the Roman bogey man. But it’s better to consider abortion on the basis of straightforward science and humanity. Fortunately the vast majority of people do not agree with you. Am I right in assuming you would ban the pill too then? If you keep lying you;ll give the impression that No voters are all liars, so you should stop doing that. You’re also giving the impression that No voters are misogynist. We already know you use slurs against the mentally disabled. I think you’re doing No voters a real disservice, belittling and humiliating and demonising your own side. Well lets see exactly the wording on the ballot paper? He said, just making stuff up now. Lads…if abortion was illegal everywhere in the world, women would STILL get them, but unsafely. Via bleach, or wire, or stairs. I think the No side must be really freaking out because everyone’s suddenly remembering how much hate the church and establishment had for women and how that lead to the 8th and the awful damage it did without actually stopping abortions from occurring while punishing women on a regular basis. David would rather see women continue to be punished. Women being punished is a price david is bravely willing to pay. It won’t be him whose cancer treatment depends on a pregnancy test regularly coming up negative, or whose fatal fetal abnormality has to be brought to terms whether he wants it to or not. The No side is desperate for everyone to forget all that and look at cute little videos instead. For you, it’s all reactionary thinking, magical thinking, grand narratives and conspiracy theories around the church, the patriarchy etc. In order to keep your little system in place, you make the simple complex and the complex simple….and happily believe falsehoods. The left has a Jim Corr! 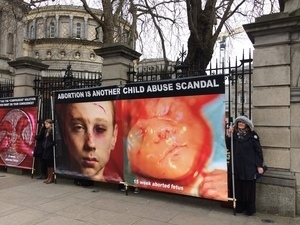 The Protection of Life During Pregnancy Act 2013 permits an abortion to be carried out in Ireland under certain situations such as foetal abnormality and complications that pose medical risks to the life of the mother. This is what people tend to focus on when you hear a broadcasted discussion….as in, in the real world. But you don’t really care about things like medical risks. You advocate for a society that awards no rights to the unborn and dishonestly use the medical argument as a foot in the door. 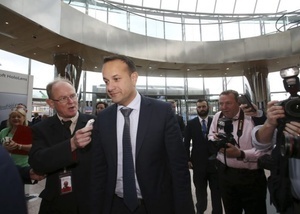 As it stands, if a person makes an independent decision to abort their pregnancy, they can travel outside Ireland – you won’t admit it, but that is a lot better than nothing and travel is not as hard as it once was. You make out like we live in a totalitarian regime. 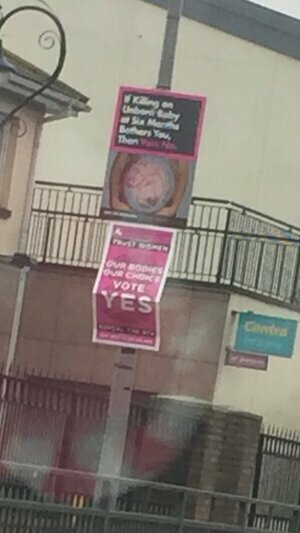 And with respect to your last line – on the contrary, the Repeal dresses up their campaign in nice colours (look at the Repeal logo for God’s sake) and conflate easy abortion access with a women fundamental right to healthcare. “Punishing women” …bleeding heart alert! See you on the next thread where you bleed your heart about the “unjust suffering of minorities” who take the bus but don’t enjoy it. I’d say I’m not too far off the mark…we’ve got bullsh*tting bullies on the left and right of the centre. I don’t know which are worse – in this case, Nigel gets the medal…for bullsh*t and trolling David. Cian is one of the very few engaging in facts on these threads. I have my doubts as to whether you are factually inclined yourself. I might cop to reactionary. I too was once a reasonable little pro-life centrist until the X-case. After that I realised that the only thing that made any sense at all was for a woman to have the right to choose whether to go through with her pregnancy or not. Most of the rest of your comnents are just you being angry because everyone refuses to see how awesomely reasonable you’re being. I’m not sure what conspiracy you’re talking about though. Even reasonable centrists like yourself clearly aren’t too reasonable to smear people you disagree with in between being patronising. Patriarchy is a conspiracy theory – the idea that men are a monolith and act in concert to oppress women. Kinda flies in the face of a male majority Dail passing the Protection of Life During Pregnancy Act 2013 by 127 votes to 31. Wow good thing I didn’t describe men as a monolith acting in concert to oppress women then. Kinda flies in the face of what you just said. Most of the rest of your assertions are of a similar calibre. It’s always the ones who go on about others not being fact-based who turn out to be remarkably factually-challenged. Still, do vote to Repeal, it is the right behind to do. Might even smash a bit off the ol’ patriarchy, eh? Aisle five, kitchenware and appliances. Let’s not call it dishonesty, let’s just call it not using all the facts that are easily available. Such as your statement that the Protection of Life During Pregnancy Act 2013 allows for FFA abortions. It doesn’t. Only where the pregnancy poses a “serious” (undefined) risk to the mother. In Ireland, if the FFA doesn’t pose a risk to the woman she has to carry through the pregnancy. That’s why 4% (approx 140 women a year) of those who travel to the UK are for “Category E” abortions. Because they can’t do that here. It isn’t a callous or casual decision. It’s simply that they feel the trauma of aborting the fetus early (80% of abortions are in the first 9 weeks…have you mentioned that fact?) is probably easier to deal with than seeing the pregnancy through and then having the issue of the child dying. I mean, any human can empathise with that difficult choice right? But in Ireland they have to see the pregnancy through…or travel. And you’re right travel is easier now. Its so easy to get on a plane, find a hotel, go through the medical referral process required in UK (you know you can’t just drop in to an abortion clinic on the way to Starbucks don’t you? ), then have the procedure, then have to leave because it’s only day procedure and have to fly home. The remains are then posted back to you. FFA is lose lose for the mother and family. Some will see abortion as a less traumatic option in those circumstances for them. Why do we have to make it so difficult? Isn’t forcing 140 women a year to go through with that process in someway “punishing” them for the FFA? So don’t be dishonest about the PLDPA. FFA isn’t included. Clare Daly tried to bring about a Bill for FFA and it got nowhere. The main reason being that the 8th amendment (of 1982) prevents it. We already know that there have been issues with cancer treatment and other healthcare due to PLDPA, again because we don’t really know what “serious” is and the 8th remains a barrier to the mother’s health. As it stands the it is an imminent likely death. It isn’t enough to have cancer because it isn’t imminent or guaranteed that you’ll die. Again, please use some honest facts to convince this triggered reactionary doesn’t think that this is in someway “punishing” women. Remind me again who doesn’t really care about medical risks here. Do you see the complications that the 8th presents for women? It isn’t fixable without its removal and new legislation. It’s the messed-up-my-etcha-sketch approach, but we have no option. Go ahead and show what “easy” abortion access means? Have you seen the proposed legislation? Do you know the UK system? That’s all factual stuff that can easy be studied and analysed. A lot of it contradicts statements like “easy access” “abortion on demand”. Having to have two medical certificates isn’t “on demand”. Three for psychological issues. It isn’t easy access. It’s qualified access. It’s a medical opinion that this is the right thing to do in the circumstances. But again, my bleeding heart has no interest in medical risks obvs. Without the rhetoric, it’s simple. We’ve seen with any attempt to legislate for FFA that we can’t while the 8th is in place. You can believe that this means that overnight women will be queuing up to have an abortion but that’s your own assumption about women because it isn’t reflected in the facts and statistics we do have. Or we can realise that in order to have some protection for women in critical health or traumatic situations, we might need to repeal the 8 (1982) and then introduce clearer legislation for that protection. At that point we men can have the arguments, pictures and lobbying of TDs about what we feel is best for women when it gets to the detail of the legislation. But right now, there isn’t an ethical argument that to help the 140 women who have to go the UK for FFA, we have to repeal the 8th and legislate for them. 1000 doctors (at least) disagree with you Listrade. Great. I mean they don’t give any information on why it isn’t an issue just that it isn’t. So here’s another short statement without detail, the Supreme Court disagrees with them. So fupp their vague opinion. Now, now Listrade, your prejudice against rational debate is showing. Ireland is one of the safest places in the world to be an expectant mother. Let’s keep it that way. Ah now. You just post a link that has no facts other than a statement and that’s a rational debate? I’m happy to debate the facts. We can make our own ethical decision after weighing up the facts. But you’ve presented none. So I’m not going to debate random links that do nothing to refute anything I posted. Rational debates don’t go well when one side poop posts and then whines about debating when their poop is called out. So the Pro Life side keep telling us and yet we see so many court cases where parents have to take the HSE to court after life changing errors during birth. The stats tells us infant mortality in Ireland is 4 per 1000 lives births. Mothers’ mortality rates is 8 per 1000 lives births. Both near the top for survival. Great. Now explain what that has to do with FFA. Nothing. We know you like doctor’s opinions so when it comes to 140 women a year with a pregnancy confirmed by two doctors that is FFA. What then? Let’s debate that. Morally and ethically move away from posting unrelated links and rationally debate whether a mother must see through FFA to birth. Let’s debate whether if you think they should, whether that’s a strong enough argument for denying them the choice of an abortion, safely and in the place they live to manage their own personal trauma. That’s rational debate, not what you’re trying to engage in. Survival. Is that your benchmark for safe? And yet we see so many court cases where parents have to take the HSE to court after life changing errors during birth. You are correct that FFA isn’t grounds for abortion. Cian, agreed, it was a bad use of a term in speed to post. I tried to expand a bit more towards the end on imminent risk when discussing cancer. Based on the UK stats, there are about 3 abortions a year that are due to the same criteria on imminent threat to life of the mother. PLDPA is for very rare cases. @Listrade, I appreciate your points and the effort taken to articulate them. I am familiar with the UK system. It is very easy to schedule an abortion within a few days from Ireland, turn up for the procedure and leave within a couple of hours without providing any medical records or proof of psychological assessment in advance or any follow up medical consultation. Simon Harris wouldn’t be in favour of Repeal if the fallout was that contentious new responsibilities would fall on HSE – responsibilities that would certainly give rise to labour disputes so you can assume that there have been talks with the private UK clinics long before now. And their lack of ethics will come with them. Ideally, the Protection of Life During Pregnancy Act 2013 would have been applied more readily practice. My understanding is that there is inertia, reluctance and a lack of leadership in the HSE on this…and I agree, it’s unethical. Had they been better instructed on guidelines and more proactive in general, we mightn’t be where we are. So they hate the baby Jesus mother? They hate women want to torture them? But Nigel when you die you will be expecting a religious burial and most probably a priest to give you absolution for your sins. They loved Mary so much they locked up single mothers and let the nuns use them as slave labour David. They loved Jesus so much they sold babies like stock. “The fact it looks like a baby makes it look human” so you’re saying that it’s not actually human, it just looks that way? This may come as a shock to you david but the Pro Choice side are well aware that abortion ends a life. That knowledge is why we understand that nobody gets an abortion lightly and this “abortion to replace contraception” line is a load of nonsense. Nobody wants to have an abortion but sometimes people need to have an abortion and the Pro Choice side would prefer that their wives, daughters, sisters and friends, should they ever need to, can have one in the care of their own doctors and not via pills bought over the web or in a foreign country surrounded by strangers as thousands of women have to do today thanks to the massive hypocrisy of the Irish solution. Ireland needs to face up to the reality of the situation and remove this bad law from our constitution. When was the last time you were at a funeral for a miscarriage? They do religious ceremonies for miscarriages in the Coombe. I was kind of gently led into agreeing to one, which, although lovely, I really feel was unnecessary. It was so fupping SAD: at the time, I didn’t want to think about it. Pfft! Irrelevant, really, I know, but I guess my point was that they made too much of it being a lost baby when I didn’t want to think of it that way. just out of curiosity (and you can ignore me if I’m out-of-line). – How far along was this pregnancy? Personally, having a partner go through both miscarriages and an ectopic (all 1st trimester – luckily), the hospital (NMH) was very much “so sad – but you can try again”. No mention of ceremonies, or getting the remains. I’ve re-read this, and it wasn’t done in a callous way – just matter of fact. NMH provided great care. Jesus Cian that’s awful for you and your partner. I am so sorry for you both. Around 16 weeks. It was the chaplaincy, and what I mean is that they had the remains in a box in a white crib in the prayer room. I was only 16 weeks along. Jaysus. I guess it was relatively unusual but they had remains (there’s more to this story but I’m not going into it) and a decision had to be made as to what to do with them. I couldn’t countenance them cremating the remains in the hospital anonymously, so the alternative was this ceremony. It wasn’t anyone’s fault: they were relentlessly kind. I’m not religious and it made me feel awful: less so because it was sad, more that I was kind of annoyed by the FUSS, then I felt guilty for being annoyed. Reading back, I guess it was my fault for not being stronger and insisting on us taking the remains away with no ceremony. As you can probably imagine, though, I wasn’t much able for smart decisions at the time. ps, sorry Cian. It’s awful. I just don’t think about it, which works well for me. I had a D&C in the Coombe for another pregnancy at around 11 weeks. Nothing of the sort was offered for that. I forgot about that one. Said she flippantly, but I really did. Thanks y’all for your kind words. We were never asked about the remains – the hospital just disposed of them – and in hindsight I’m glad we weren’t put into that situation. We just wanted to get out of there and back home. We were invited to the Annual Memorial for miscarriages in the Rotunda with the first miscarriage. I don’t remember it being overly religious though. More a recognition of a grief that’s not really publicly acknowledged. We didn’t report the second so we weren’t invited for that one. I think it’s a ceremony in some church in Dolphin’s Barn for the Coombe one. It’s ‘interesting’ how miscarriage isn’t discussed in regular conversation… but it affects huge numbers of people. I remember my mother being totally blasé about it. It was anything but run of the mill for us. Nobody’s throwing anything in your face precious. So your position is that some abortion is OK, the so called “good abortions”, and you want that enshrined in the constitution. Sadly for you nobody is offering that option and nobody is even suggesting offering that option because putting that sort of thing in the constitution makes for bad law. We’re had 35 years of bad law thanks to the 8th. The options are remove it or leave it in and allow the harm it causes to continue. By voting No you’re choosing to allow the harm continue. Careful ReproBertie (SCU), that’s the kind of thinking that gets you banned around here. Let’s apply some common sense here eh? All has the potential of life but it is a gradient scale. A conception ten minutes after it happens should not have the same rights as a fetus of eight and a half months. Now you can argue as to when that limit should be but to do that, by default you accept the gradient principle in the first place. Furthermore, once you accept that gradient principle, if a woman feels she has no choice but to have an abortion, is it not quicker for her to do so somewhere closer to her home and family rather than having to delay it by weeks if not months while organising the trip? 1. if a women has to pre-plan a trip for an abortion it gives her more time to think if it is the right thing for her to do. She gets time to make a better decision (for her). 2. if a women has second thoughts immediately before the procedure – if she is local she can call easily say ‘stop’ – and postpone for 24 or 48 hours – without much cost. However if she has had to travel there is a large cost (money, time-off work, and the cover story) that makes it very difficult (impossible for most) to postpone. anyone else have other thoughts? I don’t understand the point/question. If new legislation is modelled on the UK then a time period will be built in. It isn’t a quick turnaround. I wasn’t trivialising the decision – I imagine it is one of the hardest (if not the hardest) decisions a person can ever make, and I would think that only a tiny percentage of woman are 100% sure it is the right thing for them. My point was that an Irish woman at 10 weeks pregnant, who has struggled to organise a trip to the UK, and is standing in the clinic and is having second thoughts has to make the final decision there and then. There are no second chances for her. Whereas if you remove the travel aspect, she would have an extra 2 weeks to make her final decision. I would imagine that if you were to factor in a counselling session before the fact, it would help a lot of women in this situation. It’s an awful decision to have to make, even if you go on to know it was the right one and you don’t regret it. We barely even have that here, and what services we do have in that regard are stretched and under-funded. It’s such a pity. Ok, I get you. Sorry for the snotty response. I know a couple of friends who have travelled to the UK for abortions. I don’t think the need to travel had an impact on the decision other than adding further grief to their decision. If we adopt a similar approach to the uk (and medical professionals have the same training) there are enough “cool off” periods and advisory services to help those who are having doubts. I don’t think the travel has an impact. OK well my point was rights based and was a response to the argument that life begins at conception. Every morning after pill is a potential abortion by that logic. Does making it more difficult persuade some not to have an abortion? I doubt it myself. The very fact of travelling to another country would add to the finality and if anything, the additional stress and trauma would more than likely cement the decision in place.